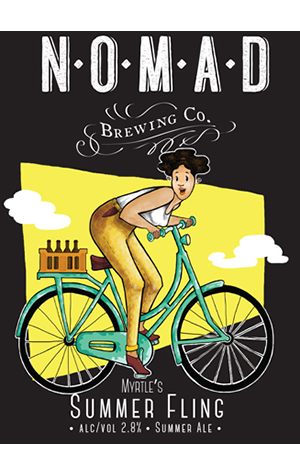 In Myrtle’s Summer Fling, the team at Nomad has released its first dedicated summer ale. However, being the slightly and deliberately off-centre brewery they are, it’s got two things to differentiate it from your average summer ale release. The first is that, at just 2.8 percent ABV, it’s a bona-fide light beer. The other is that it’s been released in autumn. To be entirely accurate, the beer has made the odd appearance at the brewery and one or two other venues in the past month or so, but it’s only gotten its major bottle and keg release since March rolled around. Fortunately the early autumn is playing its part in ensuring conditions are nigh on perfect for Myrtle, a light beer with strong character, built for warm weather. Beautifully clear with a straw-coloured glow, it features punchy Australian hops that offer up ample citrus aromas accentuated – quite significantly – by the addition of lemon myrtle to the brew. The hops have even more impact when it comes to the bitterness which is long and strong for a beer of its modest size, and that’s compounded with a healthy dose of citrus zest character; again the work of the lemon myrtle. When you factor in a slightly spicy aroma from a Belgian yeast, Myrtle’s Summer Fling is something with a whole lot more bang per bottle than your usual light beer.